Artist Mort Kunstler was once the king of hot rods, hot women and manly men. His paintings were on the covers of men’s magazines and the paperback pulp fiction of the day, as well the box tops of model car kits. “I though that would be my road to riches,” Kunstler said. His artistic road, however, has traveled through the Wild West, through the formative years of our republic, and to space. But he is best known for his Civil War work. His paintings have been published as prints, collected into books, and adapted to a variety of media including jig saw puzzles, holiday ornaments and cards, stationary, mugs and mouse pads. Kunstler has painted the Civil War battles – from Charleston to Richmond – with bullets and flags flying. But it is his ability to paint the human condition, the love and the loss, that gives his work distinction. It has Kunstler traveling the country to sign his prints and attend gallery showings. His most recent show is “For Us The Living” at the South Carolina State Museum in Columbia. The show is on display until April 7. The show has 30 painting and sketches, a highlight of the more than 350 Civil War scenes Kunstler has painted over the past 25 years. Now, at age 81, Kunstler is moving on. He recently announced – to the dismay of his fans – he will paint only eight more Civil War themed paintings. The first, “Shenandoah Strategy” depicts Confederate general Thomas “Stonewall” Jackson and a group of mounted soldiers approaching the Glen Burnie mansion in Winchester, Va. on a snowy night. The painting, Kunstler’s annual snow scene, was unveiled Saturday in Winchester. The last painting, still untitled, will center on the surrender at Appotomax. The painting’s release will coincide with the 150th anniversary of the Gen. Robert E. Lee’s surrender. Ironically, when Kunstler painted “The High Water Mark,” depicting the charge of troops led by Confederate Maj. Gen. George Pickett at Gettysburg, Pa., he thought the painting for the 125 anniversary of the epic battle would be one-shot assignment. While he already had established a reputation for his detailed-oriented work centered on history, Kunstler admitted during a recent phone interview while in Columbia he wasn’t then all that interested in the Civil War. As he painted more Civil War-themed painting, Kunstler decided he wanted to do more than paint battle scenes. “I wanted to things others had not painted,” he said. He has painted Jackson’s men using horsed to pull steam engines down the “Valley Pike,” the main road of the Shenandoah Valley, to get them to rails controlled by the Confederacy. He has painted Thaddeus Lowe, commander of the Union’s Aeronautics Corp and his hot air balloons. His heroes are not all gods and generals. He has painted common soldiers receiving apples from the adoring crowd as they march to battle. A common theme is a soldier in a tender embrace with a loved one before they depart. Several paintings depict soldiers and their faith. 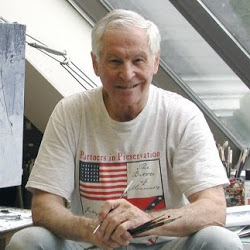 Before starting each painting Kunstler consults with experts – be it historians with national reputation to local writers – to learn about his subject. He wants to know what the weather was on a particular day. He wants to hold the weapons, feel the uniforms used. If the painting involves a building, he wants to know what it looked like during the Civil War. “If you paint it right, it looks right,” he said. He reads too. Kunstler admits he wasn’t interested in history as a child. Now it’s become part of his passion. His details are more than physical. He studies photographs of his subjects to understand the characteristics of each face. One of his favorites is Gen. Jackson. “He is easy to draw,” Kunstler said, checking off Jackson’s features: low eyebrows, high cheekbones, a prominent nose. Titled “Until We Meet Again,” it is one of Kunstler’s most famous Civil War works and original prints, when available on the secondary market, sell for $4,000 or more. To paint George Washington crossing the Delaware in 1776, Kunstler posted a dollar bill near his easel. But that likeness, taken from Gilbert Stuart’s famous painting, showed a 64-year-old Washington. In 1776 Washington was 44. “You have to take years off your vision. I struggled with that,” Kunstler said. Kunstler also faced the iconic image of Washington crossing the Delaware painted by Emanuel Leutze in 1851. While the Leutze painting has large doses of glory, inspiration and heroism, it lacks historical accuracy. Kunstler sought to paint the most history accurate version of Washington’s crossing. 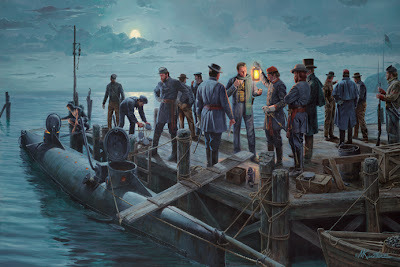 When it came to painting the Confederate submarine Hunley departing on its fateful last mission, there were no images. There were items pulled from the Hunley’s watery grave, as well as some historical accounts. And for Kunstler, there is a bit of irony with the Hunley painting. A men’s magazine assignment in the 1950s to paint a World War II submarine set him on his quest for historical accuracy. While he won’t be painting the Civil War, Kunstler stressed he is not slowing down. He still projects he will paint between 10 to 15 works a year and has commissions that will keep him busy until 2015. And that’s fine by him, being an artist is all he has ever know. He said it started when he started scribbling at 2 1//2 years-old. He insists it was meant to be. After all, he said, Kunstler means artist in German. “It’s in the genes,” he said. In Mort Kunstler’s "Final Mission" the H.L. Hunley prepares for its first and last mission in Charleston harbor in 1864.